Leading Manufacturer of scitus - bottle top dispenser with springless valve technology, 0.25 - 2.5 ml, scitus - bottle top dispenser with springless valve technology, 0.5- 5 ml, scitus - bottle top dispenser with springless valve technology, 1 - 10 ml, scitus - bottle top dispenser with springless valve technology, 5- 60 ml, beatus - bottle top dispenser with re-circulation valve, 0.25-2.5 ml and beatus - bottle top dispenser with re-circulation valve, 0.5-5 ml from Lucknow. • EasyKnob™: Volume adjustment knob that allows 180° rotation for easy and effortless volume setting. • FlexiNozzle™: Adjustable delivery nozzle that offers a high degree of flexibility. • Springless Valve™: Facilitates smooth and jam-free functioning. 2. Chemical Compatibility across the complete range of reagents. 3. Ergonomically designed, simple cost-effective blend of sophisticated features and functionality. 6. Fully autoclavable at 121 °C and 15 psi for a duration of 10 – 15 minutes. • A set of 5 adapters of the sizes – 28 mm, 32 mm, 36 mm, 40 mm and 45 mm. • Telescoping Tube, that can be adjusted according to a variety of bottle sizes. 1. Features:• EasyKnob™: Volume adjustment knob that allows 180° rotation for easy and effortless volume setting.• FlexiNozzle™: Adjustable delivery nozzle that offers a high degree of flexibility.• Springless Valve™: Facilitates smooth and jam-free functioning. 7. Accessories: • A set of 5 adapters of the sizes – 28 mm, 32 mm, 36 mm, 40 mm and 45 mm.• Telescoping Tube, that can be adjusted according to a variety of bottle sizes. 1. 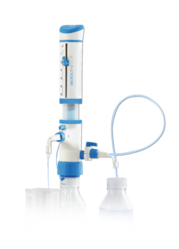 BEATUS uses Re-Circulation Valve which prevents the loss of reagents during purging by re-directing them into the mounted bottle and facilitates bubble free dispensing. 2. It has a Springless Valve™, an award winning technology which facilitates smooth and jam-free functioning. 3. It also features two product innovations:• EasyKnob™: A specially designed volume adjustment knob that allows 180° rotation for easy and effortless volume setting.• FlexiNozzle™: An adjustable delivery nozzle that offers a high degree of flexibility. 4. Designed with ergonomics and intuitive handling in mind, it exhibits excellent chemical compatibility and helps in achieving precision with reliability in practical laboratory environments. 7. Fully autoclavable at 121 °C and 15 psi for a duration of 10 – 15 minutes. 8. Accessories: • A set of 5 adapters of the sizes – 28 mm, 32 mm, 36 mm, 40 mm and 45 mm.• Telescoping Tube, that can be adjusted according to a variety of bottle sizes. .• FlexiNozzle™: An adjustable delivery nozzle that offers a high degree of flexibility. • EasyKnob™: A specially designed volume adjustment knob that allows 180° rotation for easy and effortless volume setting. • FlexiNozzle™: An adjustable delivery nozzle that offers a high degree of flexibility. 1. It uses Dual Inlet™ Technology patented in India, the EU and the US. 2. It offers 4 liquid handling modes in one dispenser. Rinsing, dilution, refilling & dual liquid handling can be performed without dismounting the instrument from the reagent bottle. 3. Other features:• EasyKnob™: Volume adjustment knob that allows 180° rotation for easy and effortless volume setting.• FlexiNozzle™: Adjustable delivery nozzle that offers a high degree of flexibility.• Springless Valve™: Facilitates smooth and jam-free functioning.•Recirculation Valve: Prevents loss of reagent during purging and facilitates bubble free dispensing. 7. Accessories: • A set of 5 adapters of the sizes – 28 mm, 32 mm, 36 mm, 40 mm and 45 mm.• For the second bottle, an additional set of four reservoir covers are provided in the sizes, 32 mm, 36 mm, 40 mm and 45 mm.• Telescoping Tube that can be adjusted according to a variety of bottle sizes. \• EasyKnob™: Volume adjustment knob that allows 180° rotation for easy and effortless volume setting. •Recirculation Valve: Prevents loss of reagent during purging and facilitates bubble free dispensing. • For the second bottle, an additional set of four reservoir covers are provided in the sizes, 32 mm, 36 mm, 40 mm and 45 mm. 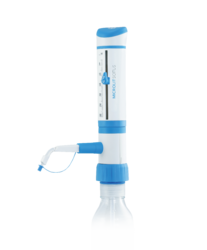 • Telescoping Tube that can be adjusted according to a variety of bottle sizes.